Once this is switched and your configuration meets all the above requirements, you should see immediately the effect in update rate. Check e.g. the Sensor List for a display. In case it works for you, please let us know what you had before and what you get with the feature turned on. In case it doesn't work, please report back too. Please always add the smartphone model, OBD dongle model, and car tested. Once I get enough positive feedback, this feature will be turned on by default and simplified. 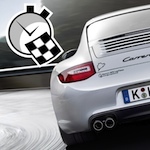 For our tests, please check Facebook post #1 and Facebook post #2 As an example, the update rate for a Porsche 997/2 increases from 11 to 17 Hz using an OBDLink MX Wi-Fi dongle. The Android version 18.3.5 will be available on Playstore in an hour, the iOS version will follow in roughly one week. Just tested this out for a few minutes with the 3/adaptive mode and saw an improvement. This type of movement means there is some issue. In case you want to create a log for analysis, please check the "Debugging OBD Connection" here in the Accessories/OBD forum and send it to me. Log file sent this evening. Looking forward to your feedback! I can also note that in my data exports (lap data CSV's, not the log) I see that MAF and Oil Temp are always set to 0, so perhaps excluding those PIDs is part of the solution? Thanks for sending the log. It shows no general issues or drops, it is simply the replies to requests vary in time needed... I don't known what the reason could be. I tend to believe it is some limitation from dongle / OBD gateway or protocol communication, but it may be some processing overload on the Android side too. 38351685780          Tx: "30 31 30 42 30 44 20 31 0D '010B0D 1\r'"
38351685840          Tx: "30 31 30 43 31 31 20 31 0D '010C11 1\r'"
38351685890          Tx: "30 31 30 42 30 44 20 31 0D '010B0D 1\r'"
38351686070          Tx: "30 31 30 43 31 31 20 31 0D '010C11 1\r'"
From the sample above you can see LapTimer requests 2 PIDs in parallel. For the MAP/VSS combination, it usually comes back after 40 milli seconds, but sometimes it requires 170 milliseconds. This pattern varies and occurs randomly for any PID combination. The reason update rate iterates up and down is due to some smoothing I apply on this rate. With a slow reply like 170 ms, the effective rate is around 3 Hz, while at 40 ms, it is 8 Hz - the rest is from smoothing / interpolation. I will check with some OBD manufacturers if this is simply as it is for car busses, or if this can be worked around (in this case, I probably need to improve the smoothing routine ). It seems the delayed replies (and drops in update rate) are due to the wireless connection. The higher update rates are, the more visible these latencies get... As always, please take care you have not too many wireless gadgets around in your car. In the past I have seen that especially Wifi connections are often disturbed when driving through town, the same thing may apply to BT connections. LapTimer uses a high priority thread to grab incoming data as fast as possible. I do not see a lot more can be done here... The S4 has enough cores to serve this thread well (opposed to dual core devices), so it should not be due to your device either. Testing this shortly here as well. Will leave Logging on and send. Some feedback on the new feature. I turned on the High Speed CAN setting and it disabled my OBD readings while in my J1850 vehicle. When I turned the High Speed CAN setting off, the OBD data collection resumed. It would be nice to be able to leave it on for use in CAN bus cars and have the application recognize that is does not apply while connected to a non-CAN bus. Thanks again for a wonderful application!! !